In 2014, Minneapolis formerly proclaimed the second Monday in October as Indigenous Peoples Day; Saint Paul followed suit in 2015. At the time, the Twin Cities were one of only a few metro areas nationally to opt for this change on what has been federally celebrated as Columbus Day since 1937. This marked the beginning of a hard fought effort to heal a deep wound at the heart of our nation and a way to educate non-native Minnesotans while celebrating indigenous identity, culture, food, and contributions. 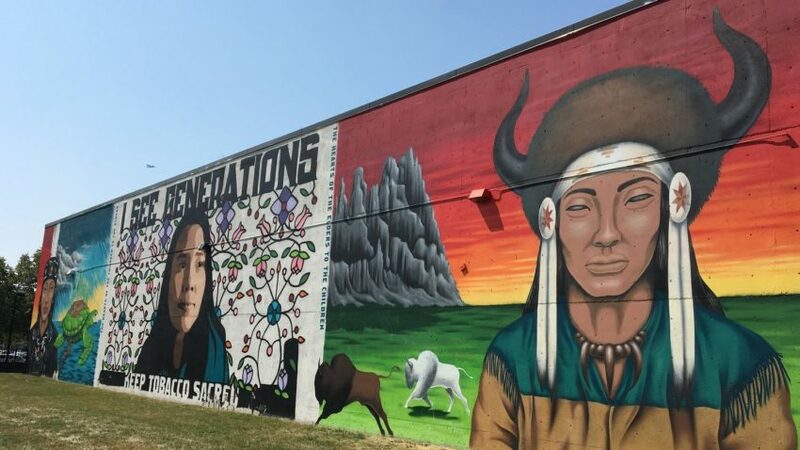 Indigenous Peoples Day recognizes that the Twin Cities occupy indigenous land of the Dakota peoples, historical traumas wrought against American Indians by colonialism, and the need to reshape the narrative surrounding Columbus’ “discovery” of the Americas. Food sovereignty is the right of people to access healthy and culturally appropriate food produced using ecologically sustainable practices. It is also the right of indigenous people to define their own food and agricultural systems from a communal standpoint rather than being defined by corporate, capitalist market demands. Similar to the cooperative food movement, food sovereignty prioritizes local markets, fair prices, healthy food access, equity, equality, solidarity, and democratic control. Dream of Wild Health, one of Mississippi Market’s past monthly Positive Change recipients, is a fantastic organization at the forefront of the local food sovereignty movement. This nonprofit restores health and well-being in the native community by recovering knowledge of and access to healthy indigenous foods, medicines, and lifeways. In Hugo, Minnesota, Dream of Wild Health runs a 10-acre farm where, with assistance from many hardworking youth leaders, they grow over 200 species of indigenous seeds, native fruits, vegetables, wild plants, herbs, and berries. How can you support local food sovereignty efforts? By using your purchasing power at the co-op! Search for food on our shelves created and sold by local American Indian communities from brands including Red Lake Nation Foods and Native American Natural Foods. Red Lake Nation Foods is the only American Indian tribe in the U.S. that grows and harvests their own wild rice on local indigenous lands in northern Minnesota. Look for their hand harvested wild rice, wild fruit jellies, and jams at the co-op. Native American Natural Foods is well known for their TANKA snack bars, made by Oglala Lakotas on the Pine Ridge Reservation in South Dakota using hormone-free, grass-fed buffalo. By purchasing these food items, you directly support independent, indigenous, community-led food systems.